How many planets could support life? In a TEDx talk, Goddard’s Geronimo Villanueva explains how scientists look for conditions suitable for life on Mars and other rocky or icy objects, and how they can take the search beyond our solar system. This year’s finalists for the Samuel J. Heyman Service to America Medal include Goddard scientist Dennis Reuter and his team, nominated for contributions to the New Horizons mission, which flew past Pluto in July 2015. Three scientists in the Sciences and Exploration Directorate have been named Fellows of the American Association for the Advancement of Science (AAAS). Lucy McFadden (693), Jose Rodriguez (614) and Compton Tucker (618) are among 347 AAAS members awarded this honor for their scientifically or socially distinguished efforts to advance science or its applications. Congratulations! The Dec. 8, 2015, talk will be given by Dennis Reuter, the instrument scientist for Ralph -- the New Horizons color imager and infrared spectrometer. Reuter will discuss the New Horizons mission and the first close-up images of Pluto. Goddard scientists will host a free public lecture on Apr. 8, 2014, to celebrate the science and exploration Saturn's moon Titan, including the milestone of the Cassini mission's 101st flyby. Dr F. Michael Flasar of the Planetary Systems Laboratory, NASA Goddard Space Flight Center, was awarded the John C. Lindsay Memorial Award for Space Science, in recognition of his very substantial and fundamental contributions to planetary and atmospheric science as Principal Investigator of the Cassini Composite Infrared Spectrometer (CIRS) instrument. Dr. Flasar is an active, hands-on leader involved in every aspect of the instrument operations and analysis, and the scientific output of this instrument would be greatly diminished without his capable direction and leadership. Mike is perhaps best known for his insightful work on Saturn¹s giant moon Titan using Voyager and Cassini data, and he is rightly regarded as one of the foremost experts on the meteorology of Titan. Michael Flasar of the Planetary Systems Laboratory recently co-authored two manuscripts that will be published in Geophysics Research Letters. The papers concern an evolution of the equatorial oscillation in Saturn's stratosphere between 2005 and 2010 studied with the Cassini-CIRS and Radio Science instruments. 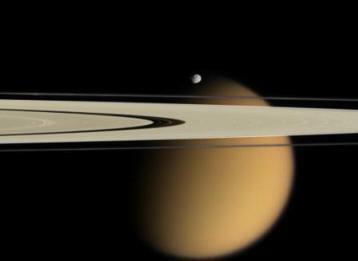 This new work provides important constraints on Saturn's atmospheric waves. Goddard planetary scientist Carrie Anderson discusses her work involving Titan in a newly-released NASA video. Dr. Anderson is a member of the Planetary Systems Laboratory working with scientists on the Cassini mission to Saturn and its moons. European Space Agency writes a web feature on the ground based observations of the Martian atmosphere by a team code 693 scientists. Drake Deming has been awarded the Beatrice Tinsley Prize, announced at the AAS meeting today. The Tinsley Prize recognizes an outstanding research contribution to astronomy or astrophysics, of an exceptionally creative or innovative character. This prize is for Drake's innovative and pioneering work detecting thermal infrared emission from transiting extrasolar planets using the Spitzer Space Telescope.